One of Russia’s principal foreign-policy goals for decades has been to split the United States from is allies. Whether by accident or by design, President Trump appears intent on bringing that dream to fruition. But trade is merely a symptom of a larger rearrangement of American alienation from its partners. The West has attempted to prevail upon Trump to retain, in some form, a series of agreements he inherited: the Trans-Pacific Partnership, the Paris climate agreement, and the Iran nuclear deal. In every instance the negotiations foundered on Trump’s allergy to compromise and immunity to reason. You can’t negotiate a climate plan with a person who considers climate science a Chinese hoax any more than you can negotiate a trade deal with somebody who believes Canada must be punished for the War of 1812. The mutual loathing contains both a personality component and a structural component. One by one, Trump’s personal relationship with the leader of each major U.S. ally has been fatally poisoned. Angela Merkel, whom Trump had repeatedly taunted and likened to Hillary Clinton during his campaign, was the first major leader to give up on Trump. “It’s difficult to overstate just how enraged Germany is about Trump,” reports Matthew Karnitschnig. Trump’s allies tell one British newspaper he “has grown frustrated with Theresa May’s ‘school mistress’ tone.” (May publicly corrected Trump’s circulation of fake videos blaming Muslims for violence.) Trump “has griped periodically both about German Chancellor Angela Merkel — largely because they disagree on many issues and have had an uneasy rapport — as well as British Prime Minister Theresa May, whom he sees as too politically correct,” his advisers tell the Washington Post. Relatedly, strongmen have the ability to deal with Trump in what is euphemistically described as “transactional” terms. China spent hundreds of millions of dollars enhancing the value of a Trump property, and in turn was quickly granted a reprieve for a telecommunications firm that had broken American law. “Those regimes take a transactional approach. Many American allies have relied on appeals to reason, data and shared values,” reports Politico, which also quotes a former Trump official helpfully explaining, “If you’re not a despot, you can’t really be transactional.” This clarifies the euphemism, because of course a democratic leader can be transactional. Democratic countries negotiate transactions all the time. What they can’t do is hand out bribes. The rise of Donald Trump has been met with a persistent strain of denial. First domestically, and then abroad, his would-be partners greeted the unfathomable election of an uneducable demagogue by convincing themselves he didn’t really mean ravings that passed for his official policies, and that they could reason with, co-opt, or otherwise negotiate with him. Trump’s domestic counterparts grasped reality more quickly than his international partners. 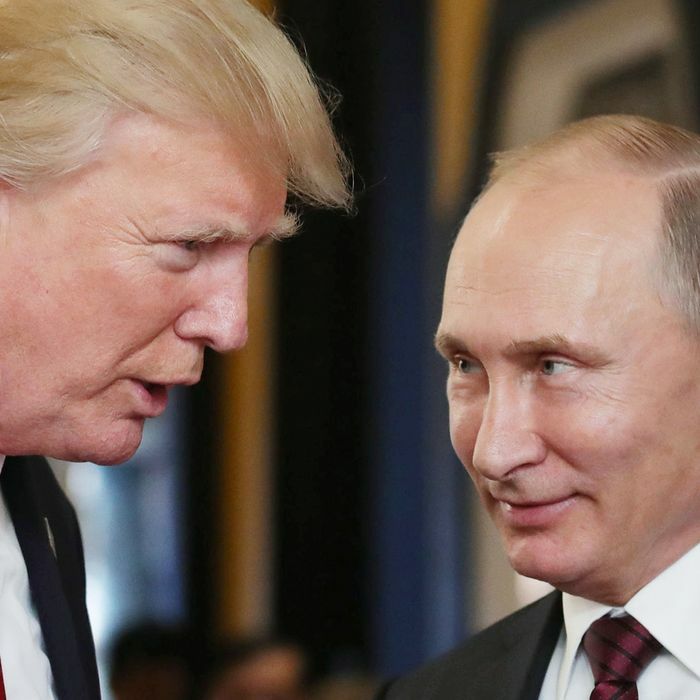 “Senior government officials in Washington, London, Berlin, and other European capitals” tell Susan Glasser “they now worry that Trump may be a greater immediate threat to the alliance than even authoritarian great-power rivals, such as Russia and China.” Trump might be a greater threat to the West than Putin. Worse, he might be, in a sense, the very same threat.